Right-click on the taskbar and make sure that there is no check next to the option "Lock the taskbar". If there is, click on it to turn that off. 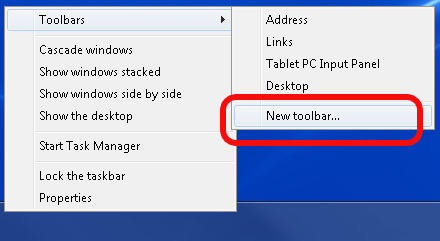 Right-click on the taskbar again and select "Toolbars" and then select "New toolbar..." option. ...and click "Select folder" button. Your quick launch will appear on the right with the title "Quick Launch". If you pull the three rows of dots to the right of this title, it will move the entire quicklaunch bar. I like to drag it to the other side of the pinned applications. 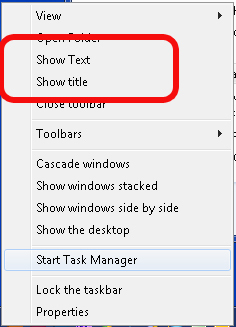 Right click on near the "quicklaunch" title and make sure to uncheck the "Show Text" and the "Show title" options so that the task bar shows only the icons for the programs. You can easily right-drag and copy icons from your desktop to the quicklaunch toolbar.